Race director Hugh Brasher says the London Marathon may implement revised start times after a crash between a runner and a wheelchair athlete. 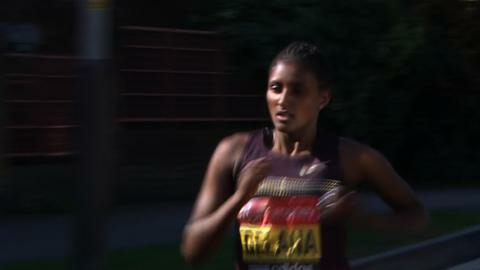 Tiki Gelana was involved in a collision with wheelchair racer Josh Cassidy as she picked up her water bottle. Cassidy said the wheelchair race should begin before the women's elite event. "London Marathon will look at the possibility of changes to start times but will not be rushed into spur of the moment decisions," Brasher said. "The elite women have started before the wheelchair competitors for the last 19 years and for the last 19 years there have been no problems." Canadian Cassidy, 28, could not continue after the collision, and despite Olympic champion Gelana's efforts to rejoin the race, the 25-year-old Ethiopian later faded in clear discomfort. After the race, Cassidy tweeted: "The wheelchairs must finally start first next year so this doesn't happen again, or worse." Asked whether it was an accident waiting to happen, Brasher said: "It was a regrettable incident but a racing incident and neither athlete was at fault. "We will consult all stakeholders, athletes and broadcasters before making a decision." Meanwhile, 2012 200m Paralympic champion Richard Whitehead was part of the field in the inaugural International Paralympic Committee Athletics Marathon World Cup. Amputees and visually impaired athletes ran in the London Marathon for the first time, as part of the IPC event. Visually impaired El Amin Chentouf of Morocco won the race in 2:24:00, with double above-the-knee amputee Whitehead finishing in 3:15.53. The 36-year-old Briton said: "Last year was a key moment in my sporting career, so [Sunday] was all about saying a big thank you to the city of London."